Starlites GIG set off strongly as they raced to an initial 10-0 lead off a respective trey from Patricia Arguello and Kristy Galea and hoops from the two centres Geocelis Reynoso and Josephine Grima. Hibs got their first action bucket after five minutes from Hannah Al Tumi, who came off the bench. Starlites still maintained the upper edge with a further three-ball from Arguello and six points off Reynoso before a quarter ending hoop from Maria Bonett had them 21-6 in the lead. Hibs did recover some ground as they started off the second quarter with a seven-point run and even had the first points from their American Amelia Simmons but Starlites still managed to keep a double- digit margin to close off the first half 32-22 ahead. Try as they might Hibs could not get closer and a further seven-point stretch for Starlites whilst Hibs missed five consecutive free throws had David Baudot’s side always in control. The game was practically done and dusted when, at the start of the final quarter, Starlites extended their lead much further after they scored 11 points on the trot as four players registered their personal double-digit scores. Hibernians: E. Micallef 1, E. Cassar 5, J. Scerri, S. Brincat 3, I. Agius, J. Abela, S. Abela 6, A. Simmons 21, N. Farrugia, H. Al Tumi 4, K. Caruana, L. Duncan 4. Starlites: H. Acreman, K. Galea 15, M. Riolo, S. Farrugia, M. Bonett 2, G. Reynoso 18, C. Curmi, J. Grima 17, P. Arguello 16, M. Cutajar, S. Davies, A. Lupo. Referees: B. Vassallo, T. Mantere, Z. Dobrosavljevic. A very low scoring match ensued in game 2, an encounter that could finally have gone either way with a final five-point run moving the win towards Paola so that the 2019 final series is tied at 1-1. Leanne Duncan was Hibs’ hero in the first moments of the game as she notched her sides’ and game’s opening seven points forcing Starlites for refuge in a very early timeout. The Naxxar side did finally break their duck and, with Reynoso and Grima sharing points, they even forged 12-9 ahead until late Sophie Abela free throws made it a marginal 12-11 game after the first quarter. A Galea trey followed by a transition basket set Starlites off in a good moment for them in the early part of the second quarter as they opened a double-digit lead, 26-16. Simmons, who only got her first bucket shortly before, and veteran Samantha Brincat tried to revive Hibs but it was still Starlites who went for the half time break leading 28-20. Both sides looked very nervous as they sought the eventual win in different circumstances. Hibs wanted to take home the victory to neutralise the somewhat big loss suffered in the first game whilst Starlites searched for a 2-0 lead which would put immense pressure in the next match on Hibs. Brincat found her shooting hand immediately when play restarted as she banged in ten personal points and managed to bring the game at par, 32-32. Starlites still did re-establish a small lead after Arguello got her only action hoop in the game after further Reynoso baskets for 39-35 with ten minutes to go. Simmons instigated her side to overturn the score at the start of the fourth quarter as Hibs made a very influential nine point run. 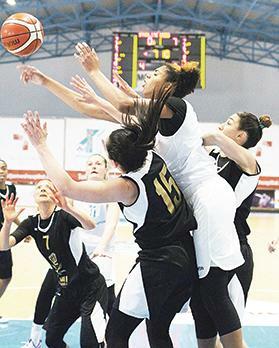 Following a time-out Starlites brought the score level again at 44-44 but in the last two minutes Simmons scored a hoop and two free throws whilst Elena Cassar potted a final free throw to ascertain Hibs’ win. Starlites: M. Zammit Cordina, K. Galea 12, M. Riolo, H. Acreman, M. Bonett 3, G. Reynoso 14, C. Curmi, J. Grima 7, P. Arguello 8, M. Cutajar, S. Davies, A. Lupo. Hibernians: E. Micallef, E. Cassar 2, K. Calleja, S. Brincat 12, I. Agius, J. Abela, S. Abela 4, A. Simmons 20, J. Scerri, H. Al Tumi, K. Caruana 2, L. Duncan 9. Referees: K. Dworniczak, D. Torok, M. Hraisha.